A quick preview for tonight’s match fellas. We play Napoli tonight in the 46th edition of the Joan Gamper Trophy (Trofeu Joan Gamper). The one-off exhibition final began first in 1966 and for those that do not know it is in honor of the founder of FC Barcelona and one time president Joan Gamper (clearly). This Swiss accountant visited Barcelona in 1898, fell deeply in love with the city, changed his name from “Hans” to Joan and one year later founded the club at only 22 years old. 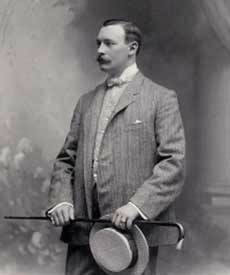 He was captain of the team and a board member for the first 10 years and only in 1908 became president. Sadly he committed suicide in 1925 at only 52 years old. Seeing as the leauge strike did go ahead, we all missed a dose of FC Barcelona, and even though I support the principles behind the strike, it was sad not to see the team. This team therefore becomes slightly meaningful as it serves as preparation for Friday night’s UEFA Super Cup against FC Porto. We play Napoli SSC (Societa Sportiva Calcio) tonight, who in recent years have been coming up nicely in Italy and are quite an exciting team to watch. They also have some of the most fanatic fans in football. Current manager Walter Mazzarri is the man credited for this re-birth and since taking charge in October 2009 has led Napoli to 6th place in his first year and managed a great 3rd place finish last season. They have a number of exciting players that have attracted interest from major European clubs. They have a firesome attacking duo in Uruguayan Edison Cavani and Argentine Ezequiel Lavezzi, but Cavani in particular had a sublime season last year with 26 league goals and 33 in total. Man City were sniffing around him pretty seriously but Napoli smacked a big price tag (think it was 50 million minimum they wanted). In the midfield look out for tough man Walter Gargano, Swiss international Gokan Inler, and in particular Slovakian Marek Hamsik. Hamsik is only 24 and for at least 4 seasons running each and every summer is linked with the likes of Barcelona, Manchester United, Chelsea, etc. In defense they have younger brother to azzuri legend Fabio, their captain Paolo Cannavaro. Other recognizable names include Victor Ruiz and Andrea Dossena. We have only faced Napoli once before and that was way back in May 1978 where a Johan Cruyff goal gave us a 1-1 draw. This entry was posted in Match Previews. Bookmark the permalink.